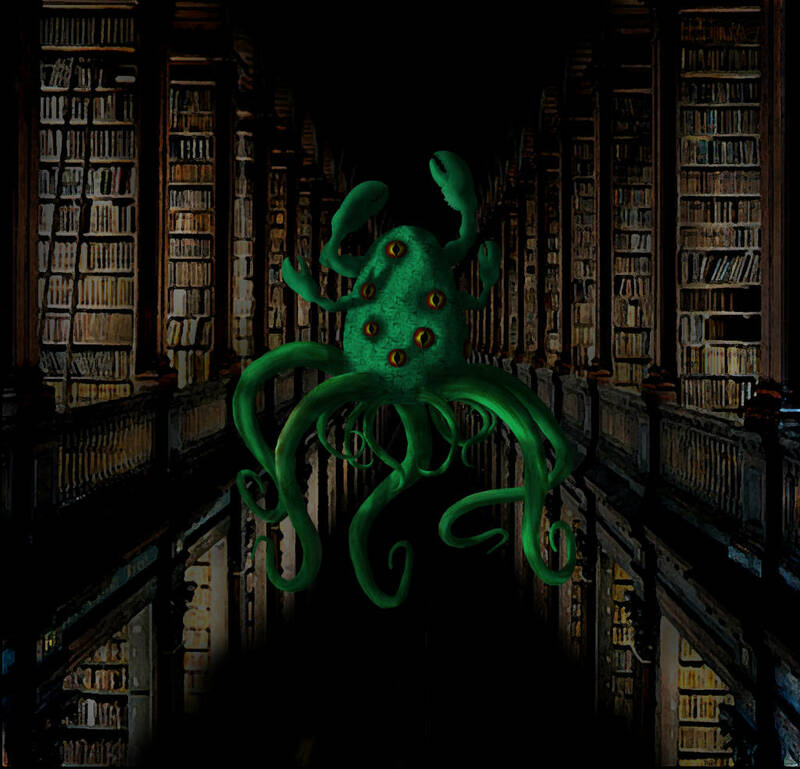 This is courtesy of Lord Hardrim Panvus Heartcraft, of Manor R’lyeh. I think he’s gone mad, but I thought it only fair to send this manuscript to you for your expert opinion before I cease funding his research. “I hope this reaches you well, Archmagister Praxis, and I pray you give it some thought before you come to any judgment. Yes, yes, I did find evidences of Dagon worship under both names “Mehrunes” and “Dagon” amongst the thick-skinned denizens of Skyrim, and should you want it I can offer a full report on that- but the information I offer is far more pressing. I have been both cursed an blessed with a revelation most dire. A revelation that, I fear, will alter the course of magical sciences of teleological nature, entire. To the west, it has long been known that the Bosmer natives worship a certain “Mora, of the Woodlands”. A spirit of considerable power, able to sequester entire clearings of space in pocket dimensions to preserve his worshippers. Knowledge hoarders, they were- even the most banal things were stored in memory crystals. Many have speculated he is in fact not Y’ffrian in nature, as the “woodlands” in his name inspires, but in fact Daedric of origin. I scoffed at the idea, until I heard a similar name in the Jerall mountains. “Hermora, the Woodland Man”, they called him. They said that it was his summoning day sometime that month (I don’t even remember the time of year it was, my brains seem all scrambled) and that due to certain cult activity in the area, for an entire week there was to be a moratorium on traversing the forests of the Jerall Mountains. Humans are, of course, superstitious folk. It is not their fault; it is their simple nature. But even a lame Dwemer automaton makes its rounds, eventually; and, by the Eight, I wish I had listened to them! I wrapped myself tight in trollskin furs and cast several spells on my poor feet to make traversing those cold routes easier. The locals tried every trick to get me to stay; the matron of the inn even hid my books so I couldn’t go off that week, but I managed to hunt them down. She seemed dead-set that if I should traverse that pass, that ink and parchment shouldn’t go with me. Seeing as how they christened me with herbs when I first came to the inn so imps wouldn’t crawl into my socks, I took no heed of their warnings. I set off early in the morning, forging through knee-high snow the entire time and aiming to make the first leg of the journey to Treacle Farms by that evening, and paying a few silver to the owners of the property to stay in their home for the evening. I continued to trudge and trudge, all through the afternoon, with no sight of any change in incline or a change in foliage for miles; it was suspiciously flat for a mountain range. Only row after row of barren trees mixed in amongst the evergreens met my gaze. I could have sworn I heard birdsong wax and wane, but not a single bird was in sight. Sometimes, I would tread for several minutes, then realize that the sound of snow beneath my feat had disappeared, only to appear again moments after I drew attention to it. It was like some queer forces had arranged the theatre of a woodland journey. I tried to mutter prayers to J’ffre, but for some reason, dare I admit it, I couldn’t even remember the name of the First Spinner. Soon, the green-needled trees began to become more and more scarce, and the wiry frames of the barren deciduous trees took hold of the landscape. Mind you- I had yet to feel even the slightest incline in the topography of that place! The branches of those trees reached high up into the air, and like tentacles wrapped around one another ever more tightly as I continued to travel further north. I was certain that I had traveled far enough to get to Treacle Farms by then, or at the very least the foot of a mountain! The air began to darken, though not for lack of sun, for I still saw Magnus’ gift break through what was now a ceiling of gnarled woody branches. Have you ever heard trees gurgle? Neither had I. What part of a tree would even make such a noise? And yet, the trees would make snapping and gurgling noises whenever my attention was turned from them. Eventually, I came upon a sign that said “Treacle Farms, one hour”. Which I figured meant two or three in heavy snow, but was contented to walk, nonetheless, to get out of this strange environment. My mind wandered for no more than- I swear it!- ten or fifteen minutes when I came upon the fence and sign for “Treacle Farms”. I always figured that Nocturnal worshippers had to see what they were doing somehow, lest they fuss and bump into each other during their ceremonies. Much was the atmosphere of that wood. Like, all of a sudden, the rules for light and dark had been overridden by some vacillating spirit. Though the queer branches above me choked out all but the faintest light, I could see almost every detail in front of me in exquisite detail; like a splendid painting by some haunted artist. Treacle Farms was easily visible, save for the very center where men in strange robes held aloft bright torches that bathed the area in darkness. Chanting echoed from that epicenter and I knew some dark and terrible rite was being performed. And the language? I heard chants in every form of merrish, in both daedric and old aedric, and even the tongue of the bosmer. I waited and listened, discerning certain words so old that I had either only seen them in obscure texts, without any indication of a possible definition, or so strange- now you will truly think me mad- that I was convinced that the lexicons from which they came had yet to be invented. Even in the silence between syllables I heard, for the first time, the hissing of the Hist and the halting choking of the Dro’Mathra. Auriel preserve me! I stood far away from the clearing, but still could see what was being summoned. If these were the denizens of the farm, or if the farmers were offered up in these rites, I do not know; but I do know what awful creature they summoned. “AE HERMA MORA ALTADOON PADHOME LKHAN AE AI” was chanted in chorus by the devotees, but this “Herma Mora” didn’t seem to be our meaning of “tree of knowledge”- it was a name. The name of some being that I fear we have been inadvertently been paying homage to many long years. From the have of the dark torchlight, a massive tentacle emerged from the ground, whipping to-and-fro. I swear I caught glimpse of it knock the head of a man clean-off, but the worshipping never ceased. They stood, enraptured with their awful god, delivering yelps of ecstasy and delight amidst their glossolalia. Silence befell the gathering as the great old one, now lazily swaying with a peculiar cadence, began to speak. Oh how it spoke. The words it spake, I could never recall, but I do remember the shapes of them. Once, I had perused a catalogue of transcripts of isoforms from the Elder Scrolls- all I can say is that the words were “shaped” like those forms. It took every ounce of devotion to gods I could not remember at that moment not to kneel before the awful thing. It spoke to me of Xarxes, of his fate and his lover. It spoke to me of moving Towers that refuted reality, and of rotund trees that were from far-off worlds. I heard of dreamers waking, and heretics dancing atop tall towers. Of a book wrapped in skin. Of a female mer with the parts of a male mer, and split down the middle with colors I have never seen on our kind on either side- in his hand a spear. I knew so well what all these things meant there and then, but now, they are only images. This was when I made the discovery. 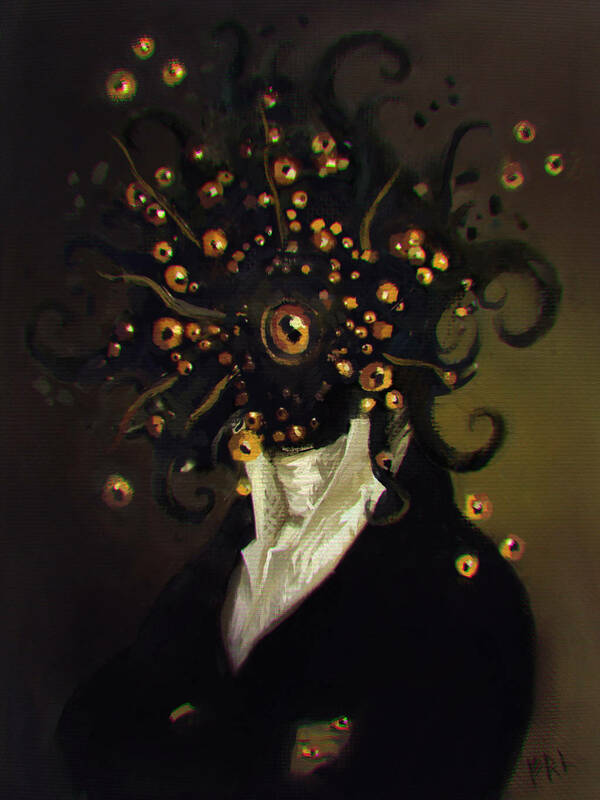 Shivers had been running through the trees; strange warps in space that I ignored while in awe of this omniscient and magnanimous tentacle, but seeing as they now neared me, I took notice. I don’t know how to tell you this without sounding like a madman. We have known of the binding of the ephemeral reality to a physical reality for many years- but my experience shows just how such things have been bound. A clearing of trees, not a hundred paces away, began to warp and buckle and come undone. I saw for the first time the true unraveling of the Mundus… and it was beautiful. Thousands of thousands of tentacles let go of one-another and revealed the illusion that were the trees in front of me. 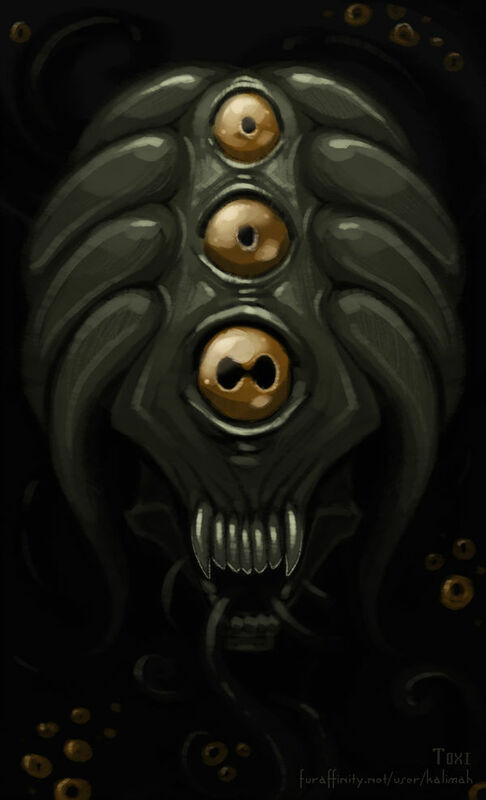 Amongst them bubbled up and slid back down golden orbs, eyes with joined twin-pupils in each. As the illusion cared to recreate itself, pincers emerged and pulled back together the seams of reality. It was like watching a weaver pull-apart their knitting, then re-knit it with the same ease as it took to unravel it. The unseen specter that moved betwixt the trees seemed at first only to care for the woody lengths, but as I looked closer, I could see that even the snow and the air unraveled into fleshy masses before rejoining as before. You see, reality is just these lengths of tentacle, but wrapped so tightly and with such dexterity that none can see the seams. At one point, the area of unraveling ventured so near that I stuck my hand in it. Indeed, Praxis, even we are made of tangled boneless limbs and lazy lidless eyes shaped into the verisimilitude of reality. What happened after that, I cannot say for certain. I wretched and left before the “festivities” ended and walked for some four or five days, my mind reeling from what I had seen. Never did I cross even a single slope before I came to the other side of the Jerall “Mountains”. What this creature was that I saw, I do not know. But there is one thing for certain- it has the answers we are all searching for, but if it should be venerated or despised is yet to be seen. I believe this thing to be the gardener and warden of reality, and we are nothing but simulations of its mercy. My eyes have been changed forever, Praxis. Even now, out of the corners of my eyes or in fine details of a scene before me, I see the forms of solid and gaseous things, alike, flicker for a moment and re-adjust their tentacles. The boy has clearly gone mad, Praxis. There has never been nor ever will be more than Eight Divines nor Eight Daedric Princes. The body of scholarly work to prove this astounding. The only Princes are: Boethiah, Namira, Mehrunes Dagon, Nocturnal, Sheogorath, Azura, and Baan Dar. Any “Woodlands Man”, “Hircine, Wolf-Father”, “Malacath”, “Mola Gbal”, or “Clavinu Vile” nonsense is to be regarded as not only bad scholarship, but also heresy of the highest order. If he should continue to espouse such nonsense, he will be relieved of his tongue and hands. Sheogorath claims another promising young soul, what a shame!